All they way from Germany, I’m totally feeling the holiday season! 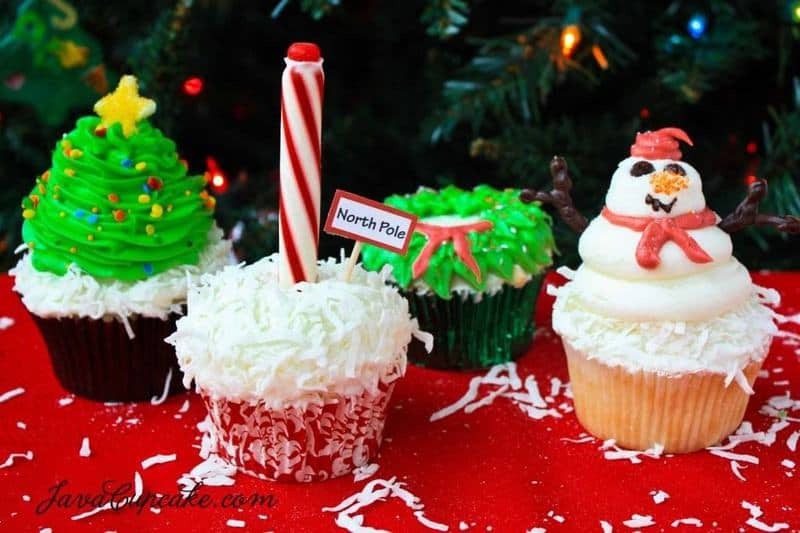 I’ve been dreaming up all kinds of fantastic ideas for super special Christmas cupcakes… so many actually that I couldn’t choose just one! 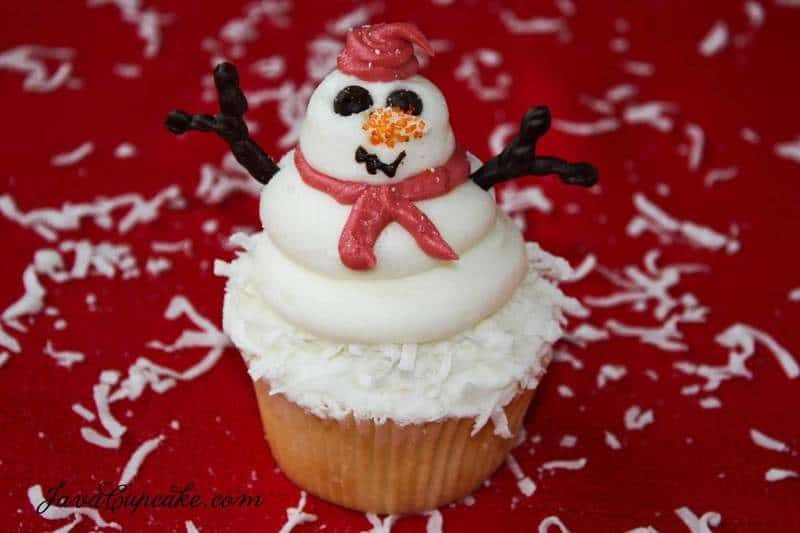 I made for super holiday cupcakes sure to impress and please your family and friends this season! Make sure to check out the photo slideshow at the bottom with ALL the pictures of these fabulous cupcakes! Using your offset spatula, spread a mound of white frosting on top of your cupcake. Using the palm of your hand, pat the frosting with coconut flakes, shaping it into a ball. 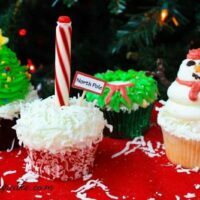 Place a small dollop of frosting on the tip of a candy cane stick and place a red hot on top. 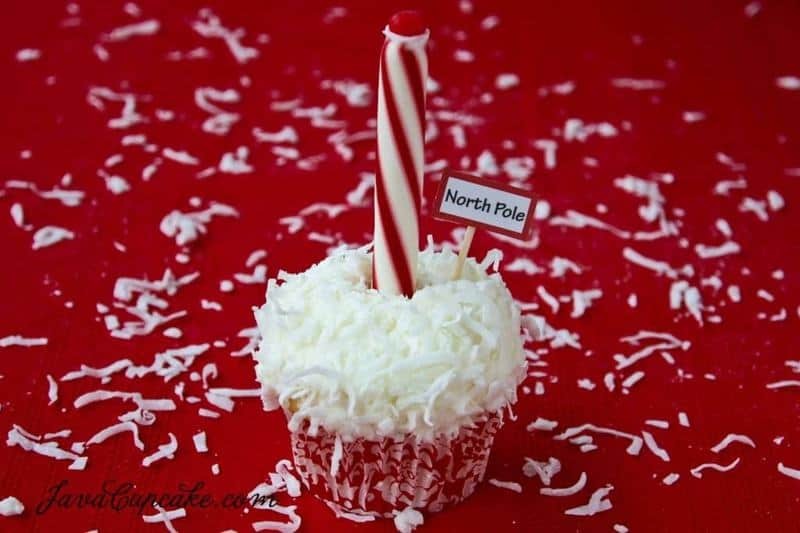 Press candy cane stick 1/3 way into the cupcake. Place North Pole flag next to the candy cane stick. For the star on top, I melted white chocolate, put it in a piping bag, and piped the shape of a star onto parchment paper on a cookie sheet. I then immediately covered it in yellow sprinkles. I put the stars in the freezer for 20 minutes to set up before place them on top of the piped tree. Make a few extra in case they break and for variety. You could also do this to create ornament shapes (dots with colored sprinkles). Using your offset spatula, spread a small amount of white frosting on top of the cupcake, completely covering it. Using the palm of your hand, pat the frosting with coconut flakes, making a flat surface. 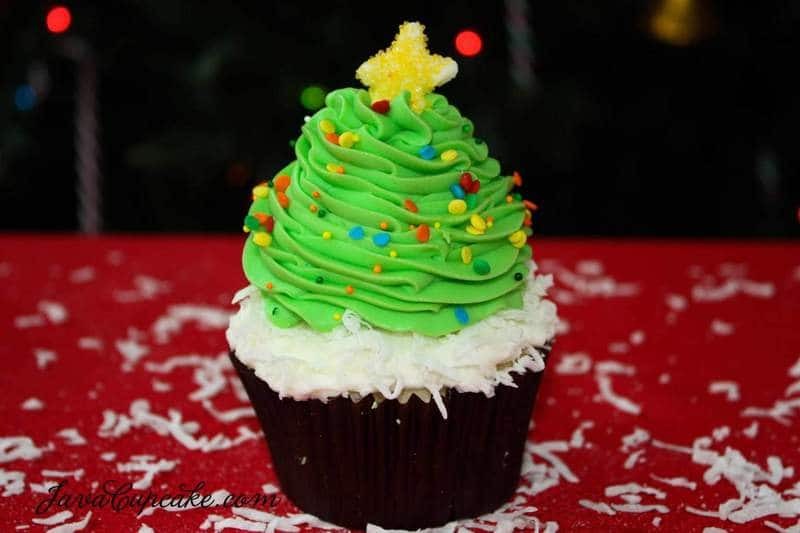 Using the green frosting in a piping bag with the Wilton 1M tip, pipe green frosting in the shape of a tree onto the cupcake. I used this VIDEO TUTORIAL I found on YouTube to help guide me in this. Use any kind of sprinkles to decorate your tree. I found that the larger round dots made better ornament shapes. Really, just use your imagination… the decorating is the fun part! For the arms, eyes and mouth: Melt dark chocolate, fill a piping bag and cut a small hole in the tip. On parchment paper on a cookie sheet, pipe dots for eyes, tiny dots for a mouth, and twigs for arms. Make sure to make a few extra of each in case they break later. Put them in the freezer for at least 20 minutes to set up. Check out this VIDEO TUTORIAL on how to make the arms. For the carrot nose: Melt white chocolate, fill a piping bag and cut a small hole in the tip. On parchment paper on a cookie sheet, pipe a small dot then using the tip of the bag, drag the dot to one side creating a carrot like shape. Immediately cover the shape in orange sprinkles. Make sure to make a few extra of each in case they break later. Put them in the freezer for at least 20 minutes to set up. To pipe the snowman, scarf and hat: I used this VIDEO TUTORIAL as a guide to pipe the snowmen. NOTE: Pipe the scarf onto the snowman before you pipe the head on. It looks more like it’s around the neck when you do this. I didn’t put a tip on the coupler when I piped the head on either. Also, I didn’t use a tip in the bag for the scarf and hat, just a small hole. For the hat, I just piped a dollop on top of his head in a circular motion and flipped it to the side a bit as I pulled the bag away. Gently place the eyes, carrot nose and mouth onto your snowman’s face. Press arms in gently into the 2nd snowball of your snowman. I used the tutorial Jennifer Shea of Trophy Cupcakes in Seattle put together for the Williams-Sonoma blog. 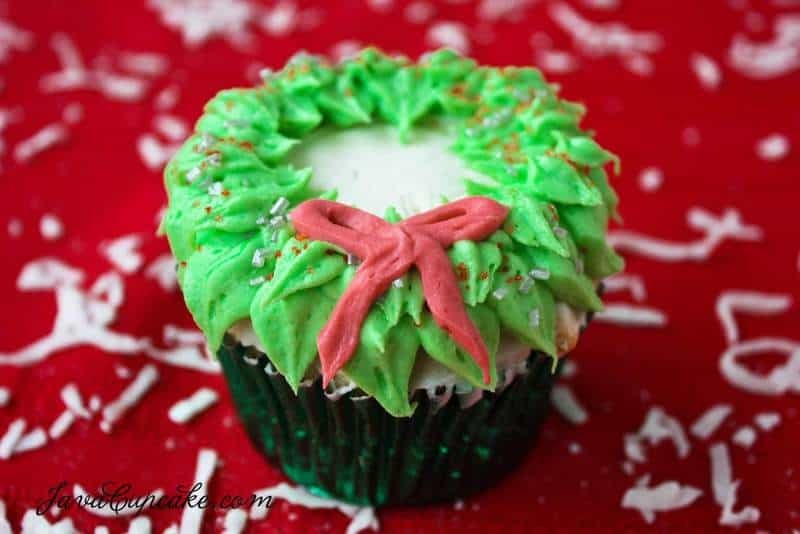 Instead of re-writing it all, you can find that tutorial HERE to create your own Holiday Wreath cupcakes! Add the egg whites and extract and mix on high for 4-5 minutes. The batter will look like it's turning into whipped cream, really light and fluffy. Whisk together the cake flour, AP flour, salt and baking powder. Add half the flour mixture to the butter/sugar and mix on low until just combined, about 10 seconds. Add all the coconut milk and mix on low until just combined, about 10 seconds. Add the remaining flour and mix on low until just combined, about 10 seconds. Note: You don't want to over mix the flour into the batter. Scrape the sides of the bowl and mix the last bit of flour by hand. Add the coconut and hot water and fold in by hand until combined. Remember, do not over mix! Fill each cupcake liner 2/3 full of batter. Bake 17-19 minutes or until cupcakes begin to turn golden and a toothpick comes out clean. Let cool in pan for 2-3 minutes before removing to a wire rack to cool completely before decorating. Add 1/3 of the powdered sugar and beat on high until smooth. Add the extract and mix until combined. Add 1/3 of the powdered sugar and beat until smooth. A few tbsp at a time, add the coconut milk... do not add it all here. Add the remaining 1/3 of the sugar and salt and beat in until combined. Add more coconut milk until you get your desired consistency. Remember, this is cream cheese frosting and it gets very SOFT so you won't need a lot of milk. Mix on high for 1 minute or until smooth. A lovely post. Merry Christmas. Merry Christmas to you, Francesca! Congratulations for another lovely and delicious looking recipe! How do you do it? Thanks and very, merry, happy Holidays! I would NEVER have thought to use coconut milk in cupcakes!! It’s BRILLIANT! And I LOVE the nose on the snowman! Love these! Thanks for these cute ideas from a fellow American living in Bavaria 😀 Wishing you all the best and hoping to try one of these awesome cupcakes out this weekend.